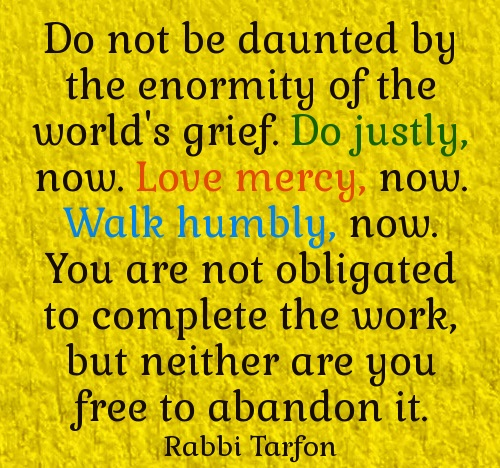 I had a ready answer for my brother: Rabbi Tarfon’s dictum in Pirkei Avot, Ethics of The Fathers (2:16), which is one of the 63 short books that make up the Mishna, but the only one that does not deal with laws, but rather, moral insights: “It is not your responsibility to finish the work [of perfecting the world], but you are not free to desist from it either.” ‘Nuff said. And my brother agreed. 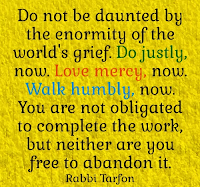 I believe that Rabbi Tarfon’s advice is so profound that indeed, he stated what most of us already intrinsically know. Still, it never hurts to hear it, especially at this time of soul-searching and new beginnings. It reaffirms what for many of us is a long struggle that, despite its frustrations, is still one we would never abandon. And the striking part was that none of his plan’s components require congressional approval. “The question is not whether we need to act. The question is whether we will have the courage to act before it’s too late,” Obama said.